A good selection of cycling route maps has been produced for Herefordshire and the Malverns, both on and off road. You can buy them in local outlets, or you can buy online with a small charge for P&P. The Cider Cycling Route Maps. What better way to explore the Herefordshire countryside than by bike. See, hear and smell the countryside, stop on a whim and visit some of the county's finest Cider producers. Map 1 starts from Ledbury; Map 2 starts from Pembridge. Copies are available from local bookshops and bike shops, and from the Three Counties Cider Shop in the Homend, Ledbury. Or click below to buy online. The Malverns Offroad Cycling Maps. Two maps - 14 routes. Developed by Ledbury cycling enthusiast Colin Palmer, in partnership with Malvern Hills AONB. For the enthusiast, three of the routes are in and around the Suckley Hills - and these are real gems with some classic descents and climbs. Particularly challenging is the 21km Route 13 which almost immediately launches you down a rocky descent and across a sometimes boiling ford, while Patches Descent, taken later in the ride is a real beaut. In the same area, the 9km Route 12 is an outstanding aerobic ride - great for an hours evening training ride. Or if you want something to enjoy with your partner, why not pedal the Poets Bridletrail (Route 7) a gently meandering ride close to the River Leadon. For families, there is the Trails and Woods of Ledbury (Route 10). An opportunity to explore the Town Trail, the Leadon Linear Park and Frith Woods. £2.99 each from bike shops, bookshops and TICs around the Malvern Hills. Or click below to buy online. The Ledbury Walking & Cycling Map. This map was produced by Herefordshire Council in 2005, and is designed to help you find your way around Ledbury. Printed copies may be obtained free of charge from the Ledbury Tourist Information Centre and the local bike shops. You can also get a copy in Adobe PDF format by clicking here (2.1 Megabytes). This download is made possible by kind permission of the copyright holders, Herefordshire Council. The Ledbury Loop Cycling Map. A rural leisure cycling route, mostly on quiet lanes, which forms part of the National Byway leisure cycling route. We commissioned this map ourselves, using a local artist. The map comes folded to pocket size to carry on your ride. The map side shows the 20-mile route, along with connecting lanes that can be used to make longer or shorter rides. The reverse side gives plenty of information about points of interest and refreshment opportunities along the route. The map costs £1, and is available from all local bookshops, bike shops and the Ledbury Tourist Information Centre. Or click below to buy online. The Bosbury & Beyond Cycling Map. Three routes from Bosbury village, of 12 miles, 19 miles and 33 miles, follow quiet country lanes through a gentle landscape of hop yards and orchards. The map describes places of interest along the way and gives information about local architectural heritage and hop growing. The medium and long routes go over Fromes Hill, where the magnificent views will more than compensate for the effort. Refreshment opportunities are listed, and links to Ledbury and Colwall stations are included for those coming by train. The map costs £1, and is available from local bookshops, bike shops, the Ledbury Tourist Information Centre and the Little Tarrington Camp Site. Or click below to buy online. The Masefield Trail Cycling Map. This is a challenging 25-mile circuit linking many Masefield connections, overlapping some of the Ledbury Loop route. Following quiet country lanes through the diverse and beautiful scenery of the Geopark, there are some significant hills that will test even the fit cyclist. Aim to take your time, with pub stops to break your journey, as you explore the landscape that inspired John Masefield's poetry. The Newent Loop Cycling Map. The Newent Loop is a 28 mile leisure cycle ride exploring the beautiful and lightly trafficked lanes of north west Gloucestershire. An optional short cut makes two smaller loops of 19 miles each. The southern side adjoins the Ledbury Loop, and the two could be combined. The map give details of features along the route and as well as the town of Newent with its black and white market house, includes a 12th century church with medieval wall paintings, a 19th century stone carved bee shelter, chartist cottages, the national perry pear collection, and even a mormon church once visited by the Osmonds. The area is known for its wild daffodils which carpet fields, woods and hedgerows in March. The map is free with all local map orders from this web page. The Ledbury Heritage Trail Map. This is a walking route of half a mile, covering some of the more historic places in Ledbury. The map costs £1, and is available from all local bookshops, and from the Ledbury Tourist Information Centre. Or click below to buy online. By Bike in the Foothills of the Malverns. Four rides exploring the landscape, culture and heritage of the Malvern Hills Area of Outstanding Natural Beauty by pedal power. This pocket-sized map was devised by LACF member Colin Palmer, and was published in 2007 by the Malvern Hills AONB in association with Natural England. The map details four routes mostly using pleasant country lanes. Single copies may also be obtained by sending an A5 or larger stamped self-addressed envelope to AONB Map, Woodview, Coddington, Ledbury, HR8 1JH. The map is also available online in PDF format (27 megabytes) by clicking here. Or click below to buy online. This free pocked-sized Guide, produced by Herefordshire Council, is aimed at both occasional and leisure cyclists. It features six rides ranging from the easy to challenging with routes through Black & White villages, secluded valleys, picturesque villages and along river trails. The routes have been designed, and tested, by Herefordshire cyclists Bella Johnson of the Ledbury Area Cycle Forum and local cycle trainer Paula McGivern. The Cycle Guide is printed on synthetic paper and is both waterproof and tear resistant making it ideal for repeated use. Copies are available at Tourist Information Centres, local bike shops, libraries or by telephoning 01432 260514. Further information is available on the Herefordshire Council website. Forest Of Dean Recreation Map. This definitive guide to the cycle trails in the central Dean area answers the question "Where can I cycle in the Dean?". Now in its fifth edition, the full colour map depicts all the routes shared by cyclists and walkers in red, while trails for walkers are clearly distinguished by being shown in black. Four suggested routes and a "round the forest" route are highlighted and described. Large tracks, smaller tracks and singletrack are clearly defined. Easily-understood contour shading is shown with 25m intervals. Many historical features are identified. Navigational aids shown include pylons, gates & barriers, old mines & ruins, streams, ditches, ponds & quarries. Pubs, shops, car parks and public telephones are included. On the reverse is a large scale map of the Sallowvallets freeride area and a detailed description of the relevant tourist information for the area. The map is available for £2.99 from local bike shops, bookshops and TICs. Or click below to buy online. 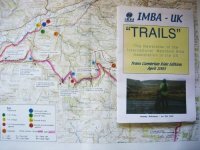 Trans Cambrian Ride Guide (Guidebook + 5xA3 maps). The Trans Cambrian Way is an epic 100 mile mountain-bike route from the English border to the Irish Sea across the remote hills and moorland of central Wales. This bundle gives you both the route guide and the five A3 colour maps.